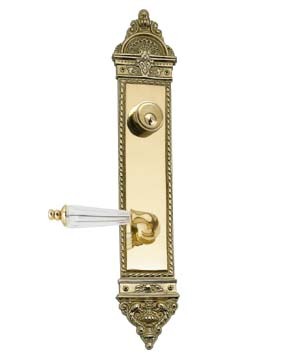 Kinsman Style Keyed Deadbolt Glass Lever Entryway Set (Polished Brass Finish) - This knob measures 4 7/8 Inch with a projection of 3 1/4 inches. The solid brass plate measures 3 inches by 16 1/4 inches. Entry set deadbolt to knob center-to-center distance is 5 1/2 inches. This entry set comes as natural un-lacquered Brass and will patina over time. A high strength lacquer coating can be applied upon request to protect the natural bright finish. Comes with tubular latch mechanism, strike plates, complete knob sets, internal mechanisms, deadbolts and complete mounting hardware. Offered in a 2 3/8 standard backset or a 2 3/4 Inch backset is also available. Entry set deadbolt to knob center-to-center distance is 5 1/2 inches. Comes with tubular latch mechanism, strike plates, complete knob sets, internal mechanisms, deadbolts and complete mounting hardware. Single door options comes as shown with two plates. Double door option includes a complete matching double dummy set for the second door. Handing is required for leversets.